I have raved many times before about how much my family (and I!) LOVE Pirate's Booty! It really is the perfect snack for healthy summer snacking this summer, especially with their individual 1/2 oz packages! It is great to throw in the beach bag, travel bag or eat on-the-go wherever and whatever you are doing this summer! But your children will love Pirate's Booty even more this summer because each package features limited-edition Finding Dory packaging. From April to June, Dory, Nemo and their new friend—Hank the Octopus—will join Pirate and his first mate, Crunchy the Parrot, to bring adventurous snacking to kids of all ages. The limited-edition packaging comes in a variety of sizes, including seven ounces, 10 ounces and a 12-pack of half-ounce bags of Pirate’s Booty Aged White Cheddar. I personally CAN'T WAIT to see Finding Dory! I loved Finding Nemo and this sequel looks just as good! Every time I grab a bag of Pirate's Booty with the cute Finding Dory characters, I get excited all over again for a family movie night watching Finding Dory! So this summer snack healthy and join Pirate’s Booty as they celebrate Disney·Pixar's Finding Dory. Set sail for a new adventure in the deep blue sea with baked to perfection puffs made with real, simple ingredients. 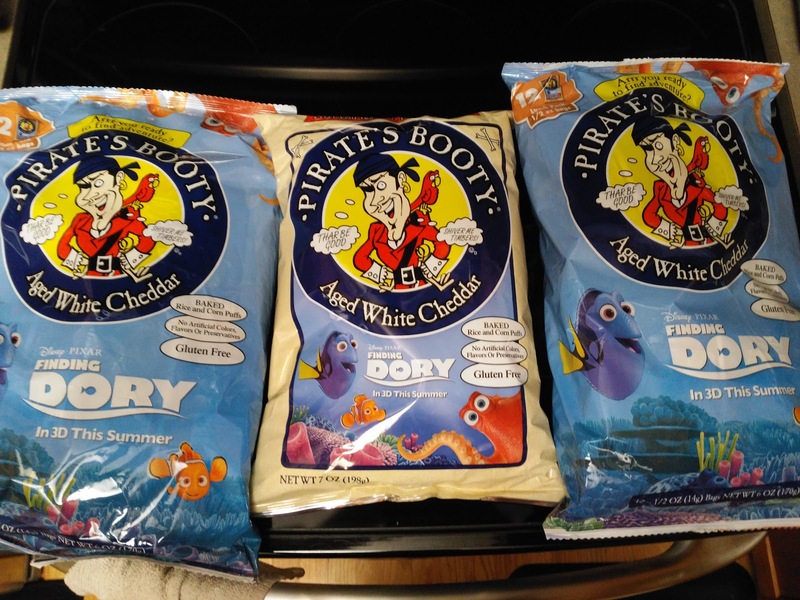 You can purchase Pirate's Booty with limited-edition Finding Dory packaging at your local retailer. We love Pirate's Booty. Perfect snack to take to the beach!